I admit it, I am one of those people who prefers the distinctive, unusual things over the everyday ordinary ones. 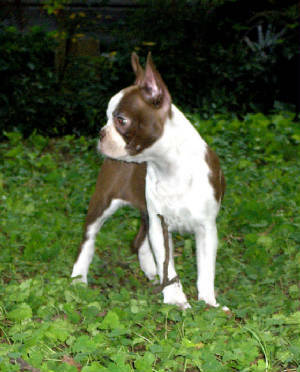 Colored Bostons are a natural choice. As an artist, breeding colors is a creative expression, The challenges of breeding dogs that have a lot of possiblities for polishing up, is exciting too. And colors are never boring! Temperament is number one on my list of priorities. What sort of temperament? One person's hyperactive dog is another's entertainment or frisbee/agility dog. I aim for a calm, stable non-noisy, easy-to-live-with companion which loves to be with you and snuggle but doesnt come unglued when alone or when you are apart. Healthy puppies make clients happy. Health is equally important to temperament ultimately. Proper selection of healthy, qualified dogs without significant flaws is the start. 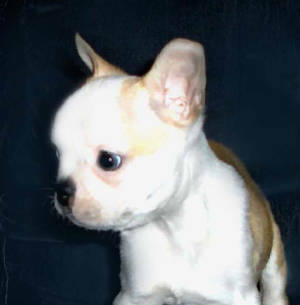 Then raising puppies with good nutrition and constant awareness/prevention of the parasites and diseases pups are susceptible to is essential. We do our utmost to raise puppies that are genetically, mentally and physically in optimum health to ensure you and the dogs long-term happiness. BREEDING GOALS~I am a professional artist which helps define my breeding plans. Dog breeding can be an artistic expression. That is one aspect of what it means to me. I want to create beauty, appeal,and balance...and, well..cuteness too! It is my aim to create colorful Bostons that will represent the standard well, be easy to live with, smart, trainable, and healthy. I have a vision of flashy-marked, blues, fawns and reds, with good structure, pretty heads, and short noses, dancing in my head. It is exciting, challenging, and satisfying to see progress towards one's goals advancing with each litter. For those who are not breeders, I want to add, this is not an easy task. It is like raising children in many respects. Raising dogs right is an "on call" 24 hour commitment that can easily deprive one of sleep for days during litter birthing, or if a puppy is sick. Dog people know there are no vacations, weekends off or holidays..not for most of us. It is never a thankless task though. The best of it is playing a part in the happiness that a good match of client and puppy can bring to both lives. And the affection of my own canine family, makes me so very grateful. 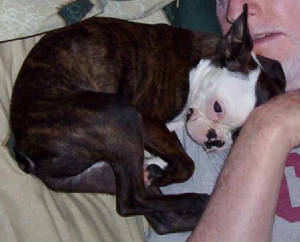 WHAT TO EXPECT when getting one of our pups~There is much negativity, unkindness and dishonesty in the world around us. I intend not to contribute to it. I believe in living with fairness, sincerity, and compassion. And not with some distant idealism, but in daily life. Perhaps this sounds corny, naive, or even pretentious, but I am completely dedicated to this. Success, to me, is only success when something is mutually beneficial. I tune in to each puppy's personality as much as possible and try to represent each one's temperament and appearance accurately and truthfully. It is most important to try to match the puppy and new family well. If you or I dont feel I have what you want, I will gladly help you find one elsewhere if I can. When you choose one of my puppies, I want to do all that I can to make the experience as easy and enjoyable as possible. I will be courteous, not talk down to you or interrogate you, will not be rude, critical or unkind. I do ask for the same in return. To anyone who wants to publicly to condemn my choice of colors, we each are entitled to our beliefs. I do understand your view, having shown dogs for years and participated in rewriting a standard even. Please dont contact me or post your comments just to condemn, there is nothing constructive in that..